Welcome to Episode #32 of the Living Homegrown Podcast! This week I interview Jessi Bloom of Northwest Bloom. She’s an ecological landscape designer, professional horticulturist certified arborist and the lead designer and the owner of the company Northwest Bloom in Washington. 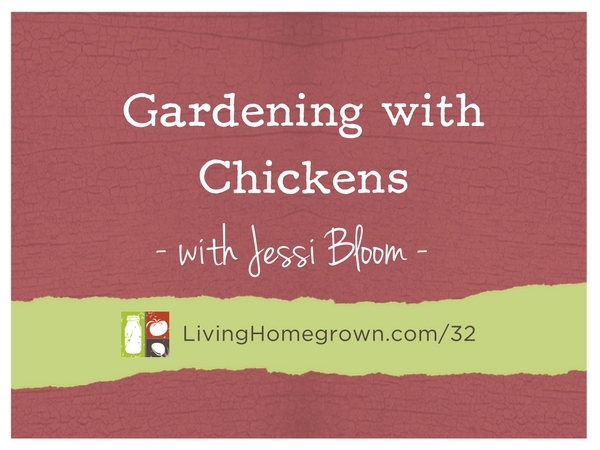 And Jessi has also written two books – One on permaculture and one on backyard chicken keeping. It’s the chicken keeping book we’re chatting about on this week’s podcast. Free Range Chicken Gardens – How to Create a Beautiful Chicken Friendly Yard. This book is perfect for the person wanting chickens AND a beautiful garden at the same time. It’s all about creating a habitat for your chickens so they can be free range without destroying your yard. Plus it has lots of practical tips for living a bit more sustainably too. I enjoyed this podcast and will get Jessi’s book. I hope there is information as to how to keep chix safe from predators during the day when they are free-ranging (i.e., foxes, hawks, eagles). I would like a future podcast to cover a topic on herbal ways to keep chickens (i.e., bedding additions, herbs in waters, herbs to support chicken health and herbs to reduce pests (mites, etc.). Thank you! Love this podcast. Excellent suggestion Kathy. I’m adding that to the list of podcast topics!